A special chocolate coin for a very special day. Most people will be familiar with Tower Mint for their minting services to government treasuries and global marketing companies, however most people don’t know that aside from minting currency and commemoratives Tower Mint has a very unique sister business also based at our South London site which specialises in chocolate coins. Heritage Chocolates was the brainchild of Raphael’s wife Marilyn who wanted to see some fun injected into the world of coins. The idea grew from humble beginnings combining the traditional coin minting skills of Tower Mint to produce chocolate coins and medals that are perfect as gifts, to mark a special occasion, and to use in sales and marketing promotions – or simply to enjoy! Offering a personalised chocolate coin service Heritage Chocolates offers bespoke chocolate coins in three sizes: 127mm, 80mm, 32mm and with a wide array choice of foil colours. The chocolate is made from only the finest quality Belgian chocolate. One of Tower Mints customers called Royal Collection Trust approached Heritage Chocolates with the request for a bespoke 127mm chocolate coin to go inside a special gift bag presented to the 2,640 Royal Wedding ‘golden ticket’ attendees who were invited to watch Harry and Meghan’s nuptials in the grounds of Windsor Castle. 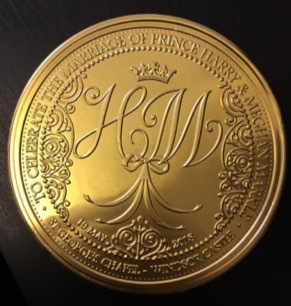 Heritage chocolates were more than happy to rise to the challenge and after a rigorous process of modeling, die creation, wrapping, embossing and packing the Royal Wedding chocolate coin was finished. It was at this point Heritage chocolates thought they had seen the last of the royal wedding chocolate coin however shortly after the wedding the chocolate coins along with the other contents of the wedding goody bags began appearing on internet auction sites for as much as £20.000. Heritage chocolates are incredibly proud to have been involved (even if very small) in the Royal wedding and wishes every success to the futures of the newly married couple.